Hakusan, Japan, December 4, 2018 – EIZO Corporation (TSE: 6737) today announced that eleven of its FlexScan EV series monitors are among the first products to meet the new TCO Certified Generation 8 criteria. TCO Certified, organized by TCO Development Sweden, is the world’s most comprehensive sustainability certification for IT products. It concerns socially-responsible manufacturing and environmental awareness, including the handling of hazardous substances and recycling, as well as user ergonomics. 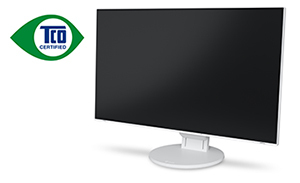 EIZO has actively participated in the TCO labeling system for monitors since its inception in 1992. In addition to the below listed models, EIZO plans to receive certifications for future products. All product names are trademarks or registered trademarks of their respective companies. EIZO, the EIZO logo, and FlexScan are registered trademarks of EIZO Corporation in Japan and other countries.